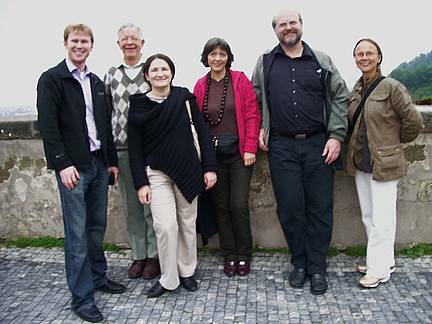 The Mission and Postmodernities core group met in Prague on 22-26 June 2009. Those present were Rolv Olson, Kajsa Alstrand, Andrew Kirk, Teresa Francesca Rossi and Tania Petrova, who were joined by Kirk Sandvig, Edinburgh 2010 Youth Coordinator. They had some fruitful discussions that probed into the ways mission has been affected by the various notions of postmodernity. After reviewing the submitted papers, the core group evaluated the definitions given to the topic of ‘postmodernities’ by discussing key points found in both the papers and in their common understanding of the subject. They then related how this, albeit complex, understanding of postmodernities has affected the nature of Christian mission throughout the world. Although most of the papers and core group members are representatives of the West, the core group tried to incorporate issues of mission and postmodernities found it the global South. In recognition of the commitment made by the World Council of Church youth organization ECHOS to emphasize this topic among youth, the core group felt it important to seek feedback from youth in order to better incorporate the concerns of youth in the Mission and Postmodernities group report to the Edinburgh 2010 conference. The following papers have been submitted to this study group. They are available for viewing or download by kind permission of the authors. The papers do not necessarily represent the views of the sponsors of Edinburgh 2010.